Embellishes and retains a younger appearance to the skin. 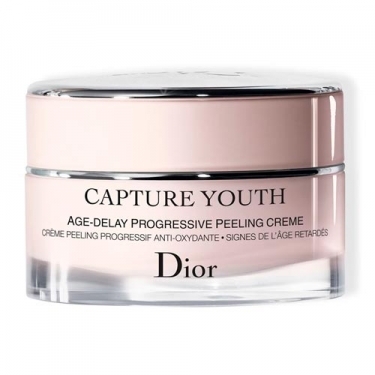 DESCRIPTION: Capture Youth Peeling Creme from Christian Dior is a moisturizer infused with antioxidant iris and vitamin B3 invigorating, which maximizes the antioxidant power of the skin to help protect and strengthen your youth while minimizing surface imperfections. Instantly, the skin on the face appears clarified, smoothed and energized. Day after day, the complexion seems to change. Gently treated, the skin becomes lighter and more even. The signs of aging are noticeably postponed.